The Zero's heavy attack counterpart, the Falcon, was also in the stash, and as I've been able to convince myself it will be a trouble free almost-blitz to build, I decided to move it to the bench. The parts have been hit with matt varnish in lieu of primer, which is currently curing. 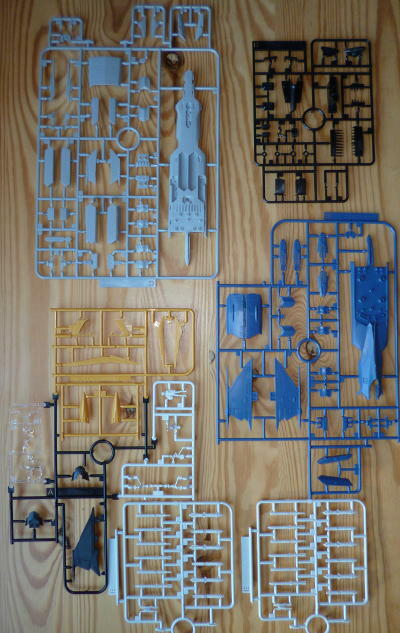 The weapons sprues are a sub-set of those that came with the Zero, and will be ignored. If I decide to add things under wings, I'll use the half made ones from the other kit. Like the Zero, the Falcon comes in two variants. Usually it would be the CAG's mount that has the wildest markings, but it doesn't even have teeth, so I picked his second in command's machine. The only parts that needed more than a firm squeeze to lock into place were the yellow leading edges of wing and tail. I suspect this is by design, but I can't read the text on the instructions..
Construction is mostly done, and was mostly uneventful. Little or no cement up to this point, just on the leading edges. I'd hoped to pose the model with the weapons bays open, but the doors tried to occupy the same space as the undercarriage doors, so that was impossible. Some remedial cementing is planned for the next few days, then it will be ready for spot painting and decals. 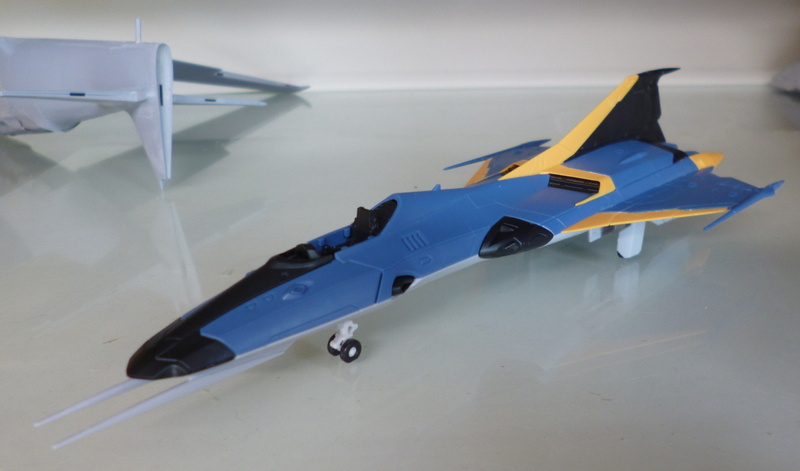 Compared to the Zero, this is a much more conventional design, one of those almost but not quite realistic types. 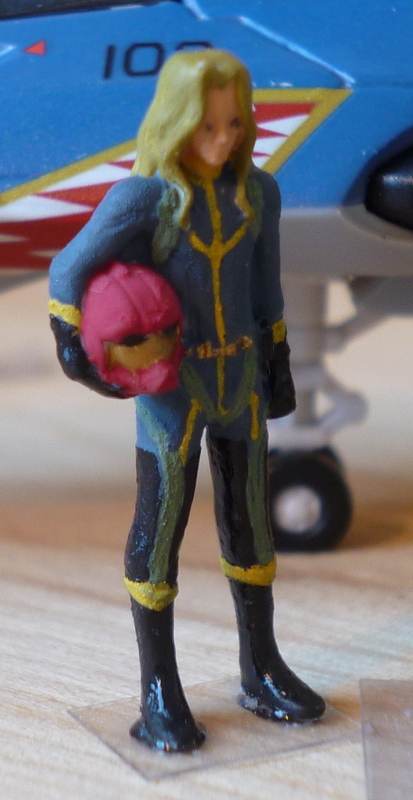 Meanwhile, I seem to have run into a spot of trouble with the Falcon. Some of the blue areas have discoloured from contact with cement. I'll have to come up with some trickery to compensate. Just found out that the big 'ol shark mouth will obscure at least some of the damage. Just love those little coincidences.. 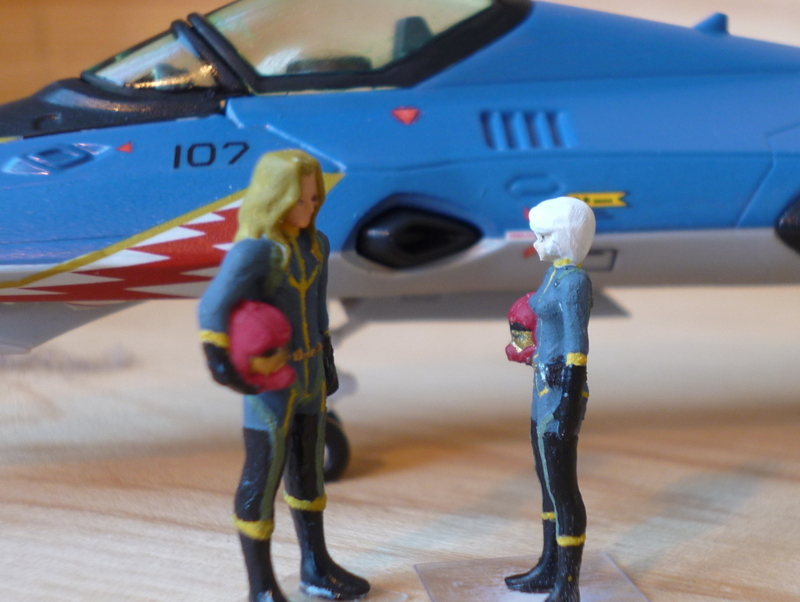 I've decided the discolourations are just too much to tolerate, so I dug around my pile of paints, and found that Model Master "True Blue" is an almost perfect colour match for the blue plastic. Almost isn't good enough for spot painting, of course, so all the blue parts (with the exception of those at the engine exhausts) will have to be painted. The port side of the plane has been so treated, the starboard side will have to wait until the port side is fully cured; I need somewhere to put my fingers on the model to hold it while painting.. The paint isn't just a good colour match, but quite well behaved too. High gloss finish, yet it dries in a few hours. 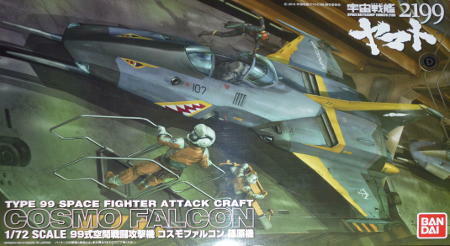 The damage control is done, and save for some drying time, the Falcon is ready for decals and some minor spot painting. Started work on the Falcon's decals. It might have been better to put the teeth on before the nose spikes, but I managed to fudge it. 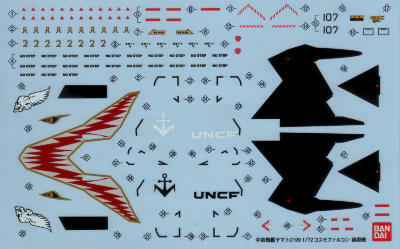 Bandai uses three decals each to cover some large areas of each wing, in stead of suggesting black paint. 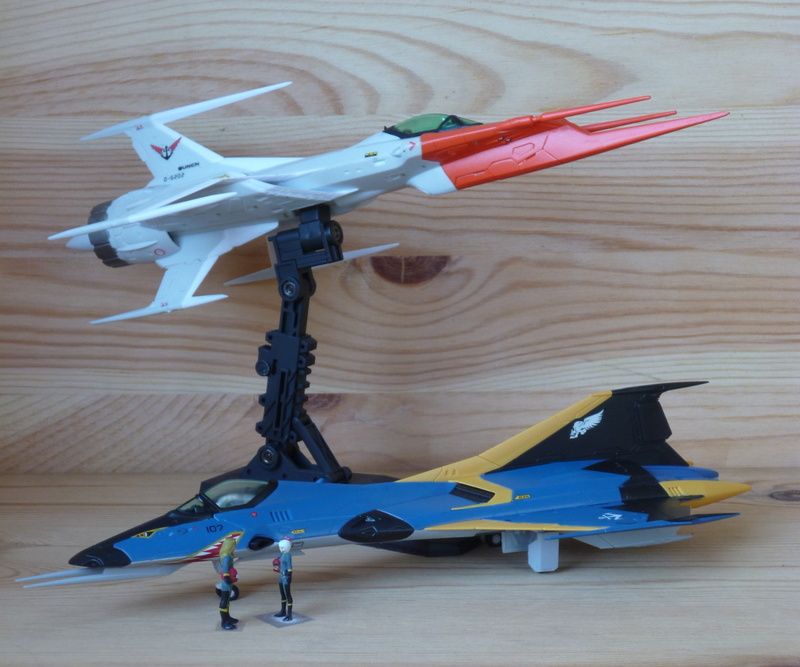 This just doesn't work well; the decals cannot take into account the fact that the wings aren't completely flat. Heavy duty solvent will only go so far. I've made some cuts in the overstressed decals, which should allow them to lie flat, albeit with gaps showing, which I'll then have to spot paint over. I just hope the black is as black as it seems at first sight, not almost-but-not-quite black that will make the spot painting stick out like a sore thumb. The Falcon is done. There's still some work to be done on the pilot, and then this project will be complete. Shinohara-san finally got his paint job. With that, I'm calling this a wrap.